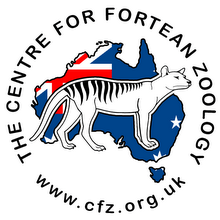 Centre for Fortean Zoology Australia: Black panther case one for the book! 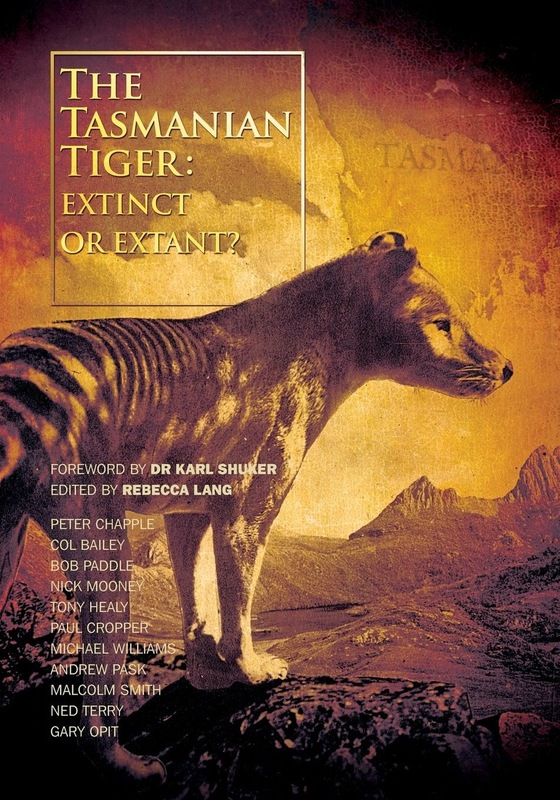 The following sighting is featured in Australian Big Cats: An Unnatural History of Panthers, and is one of the more puzzling and thought-provoking of the hundreds authors Rebecca Lang and Michael Williams have examined. The anonymous Daisy Hill farmer was alarmed to come face-to-face with an animal he'd never seen before as he checked on his cattle one afternoon. The above picture was all that remained of one of his calves after several hours! "I was driving up a track (if you could call it that) through the bush on our property looking for this missing cow in driving rain, the Blue Heeler dog was leading the way as usual about thirty feet in front of the car when all of a sudden he took off through the bush to my right, the rain had eased right off so I wound down the window to see where he'd gone, before I could even whistle he was jumping in the window of the car yelping and whining. "I jumped out and saw the mother cow lying on her side about 30-40m in through the trees as I slammed the door shut I turned and saw it, a bloody huge cat sitting behind the cow. It stood up, glared at me for what was probably about 3-4 seconds and without a sound it took off through the bush. It was dark grey like a wet 'roo (Kangaroo) but with some ginger in it, had a broad head, short legs large shoulders, a long body and a long thick tail. I reckon its body was probably about 4.5 foot long and about 2-2.5 feet tall. "After collecting myself, still shaking and hair still on end I slowly approached the cow which I could see was barely breathing I noticed her dead calf about 2m from her. The cow had a broken front leg, twisted hip and pinched nerve in her back was in a terribly distressed state. "The spooky thing is there was a total absence of any blood or other tissue around the site of the kill and the calf was missing a leg which was cleanly removed from the ball joint without breakage, its jaw was broken, tongue missing, neck and back broken and approx half of the calfs' hide was also missing. Not to mention its torso was opened up and virtually licked clean. "As a keen wildlife photographer and hunter I am fairly adept at tracking animals however I was unable to find any fresh tracks in the area. No dog or fox prints, no 'roos and definitely no cats prints. "I have found several dead 'roos killed in a similar manner in both deep gullies and open ground on the property, one was even decapitated. 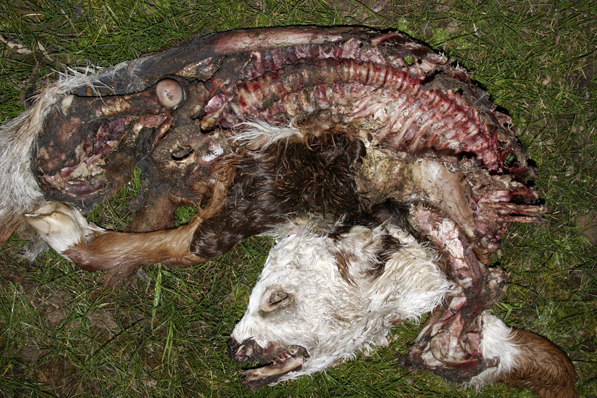 These were large Kangaroos capable of high speeds and once again the necks and jaws were broken, torso opened up and licked clean and no signs of blood or the usual mess associated with a dog attack or fox kill. "Now I've spent a lot of time in the bush and have seen all kinds of weird animals in places they weren't supposed to be but I have never seen anything like this cat. Unlike all the stories I've been hearing from local farmers and other nut-jobs this was not a so-called 'Black Panther' nor do I believe it was a Mountain Lion it was like some kind of bizarre hybrid. Judging by the length of the tail it couldn't be a typical 'feral tabby' either from the brief glimpse I got it seemed to have some marsupial like attributes. "All I do know about this thing is Parks Victoria and the DPI don't want to know about it."